Throughout life, we make a variety of important decisions: where we live, who we work for, who we marry, where we send our kids to school, and more. 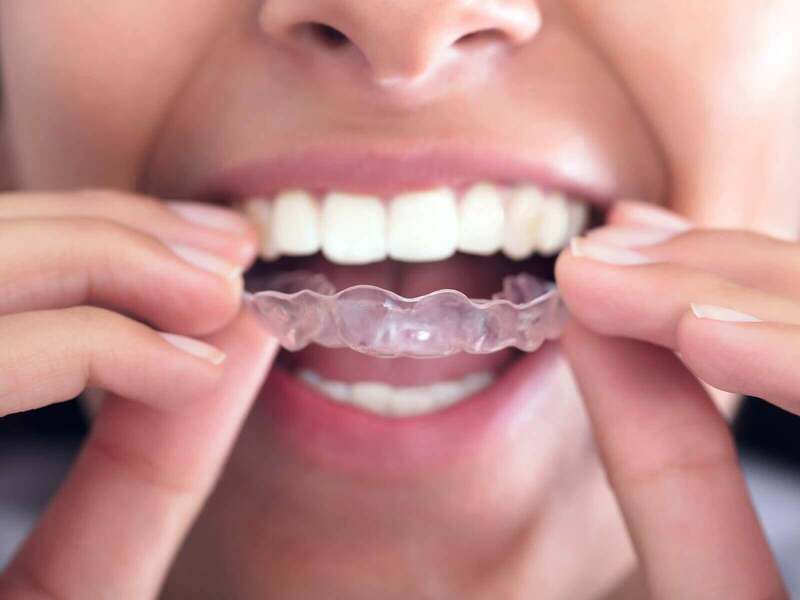 With oral health and smile confidence being an important aspect of your physical and emotional health, picking the right dentist for you is just as important. When going to the dentist, you want to feel comfortable and welcomed, feeling certain that you are about to receive top-notch care. 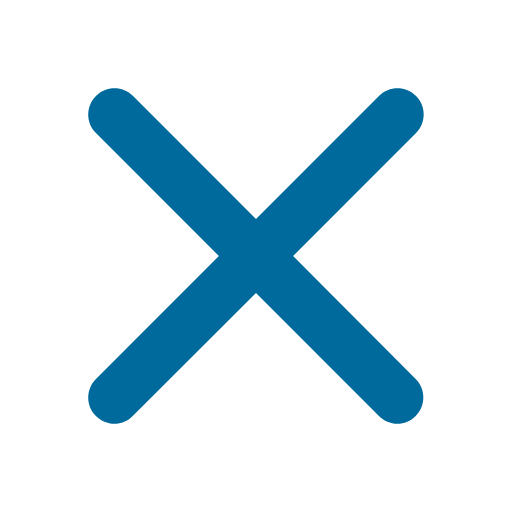 But finding this in a dentist or medical provider isn’t always a walk in the park. If you’re looking for the perfect dentist in downtown Pittsburgh, look no further than Sixth Street Dental Aesthetics. What makes Sixth Street Dental different? We’re here to break to down for you. Finding a dentist that your trust and create a bond with is key in finding the right dentist in Downtown Pittsburgh. Dr. Zotis of Sixth Street Dental is renowned for her ability to build positive patient relationships through her expertise and warm personality. Dr. Zotis earned both her BS and DDS from Case Western Reserve University School of Dentistry, but as a lifelong Pittsburgh resident, knew she had to bring her talents back to the City of Bridges when starting her own practice in 2006. 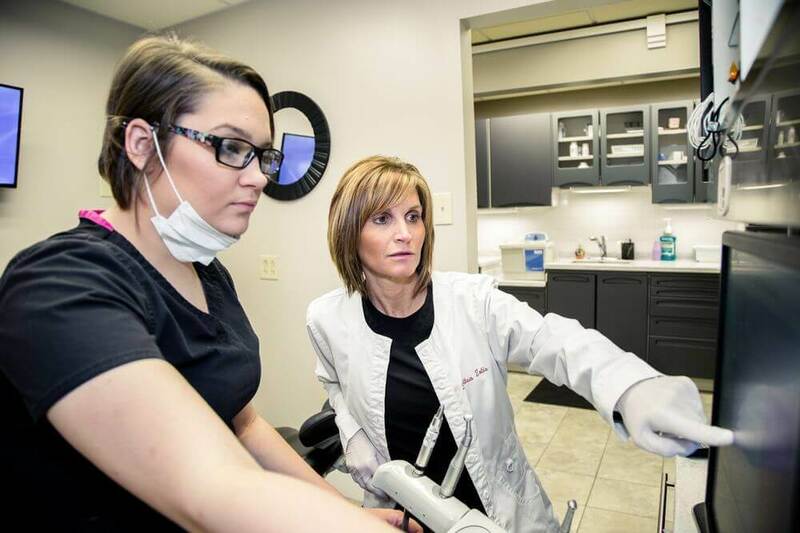 This motivation to create the healthiest, most beautiful smiles in Pittsburgh translates into her work each and every day -- feeding in to Dr. Zotis’s continuing of her education to constantly bring her patients the best, least-invasive treatments. We get it -- going to the dentist can be nerve wracking. For patients with traumatic memories of previous dental procedures and treatments, going to the dentist can be a serious source of anxiety. This is why Dr. Zotis and her team work diligently to provide unique treatment to each patient’s needs. 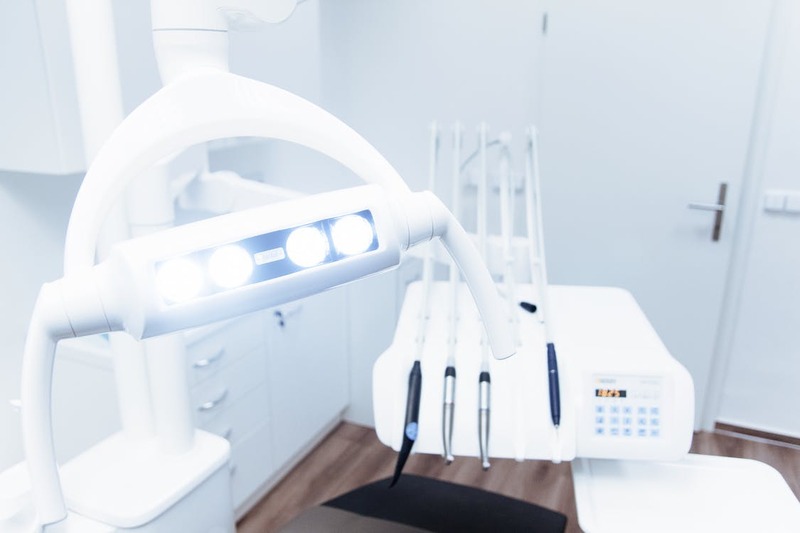 Whether you need a slower treatment or more careful treatment, Sixth Street Dental possesses the patience needed to bring dignity back to the dental chair. Dr. Zotis and her team are always there to work with you to create a care plan that works for you and your concerns. After developing such a positive rapport with Dr. Zotis and her team, you won’t want to have to find a different dentist to care for your various needs. This is why Sixth Street Dental Aesthetics is the one-stop-shop for all your dental needs. From standard checkups, to Invisalign, and aesthetic treatments like Botox and lip injections, Sixth Street Dental Aesthetics does it all. When working with Dr. Zotis, she welcomes you to start an open conversation about your smile goals and any insecurities you have surrounding your smile, from which she can suggest the treatment that can help you finally begin putting your best face forward. You have a busy schedule, and it sometimes feels impossible to find a dentist that works with your schedule. Because we’re a dentist in Downtown Pittsburgh, we’ve created a schedule that works for the people we serve in our community. Opening at 7:00am Monday through Thursday, we’re there to squeeze you in for an appointment before work or class. Additionally, on Tuesdays and Thursdays, we stay open until 7:00pm for anyone who finds their days and mornings too hectic to make it in. For your convenience, we also are available on Fridays by appointment, so you don’t have to sacrifice top-notch dental care just because of your busy schedule. For your convenience, we chose to put our office in the heart of downtown Pittsburgh. 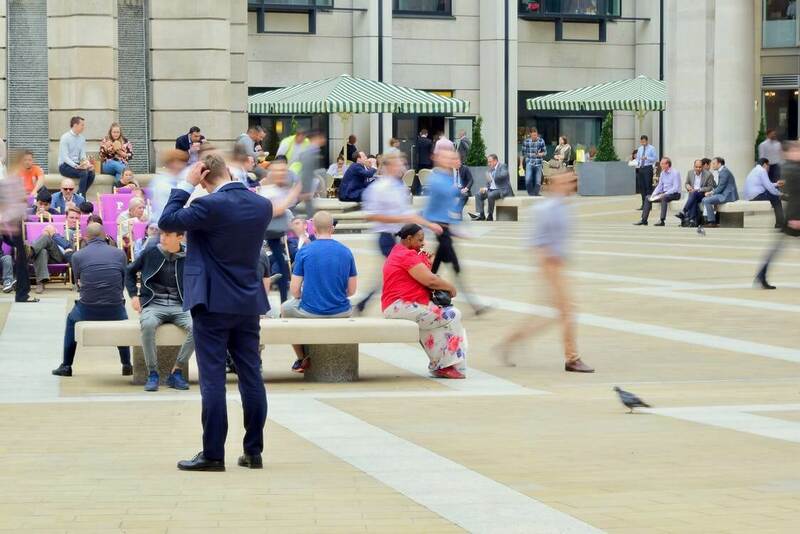 Not only is our office walkable from nearly anywhere in the 11x11 block business district, but can be found at the heart of commuter lines. Easily reach our office by foot, bus, or by taking the T from the north or south sides of the city. 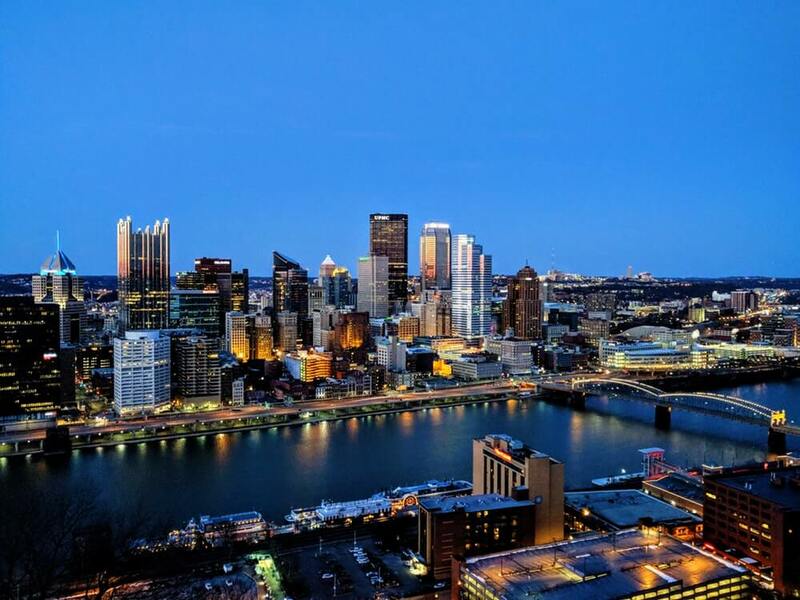 As a great location for Pittsburgh professionals and students of the downtown Pittsburgh universities, Sixth Street Dental is proud to be in the middle of the city we love to call home. I've been going to Dr. Zotis and Sixth Street Dental for over a decade. They have an incredible staff and put the patients' needs at the top of their priorities. They work with the Insurance companies as best as they can and go to bat for the patients. I highly recommend Sixth Street Dental! 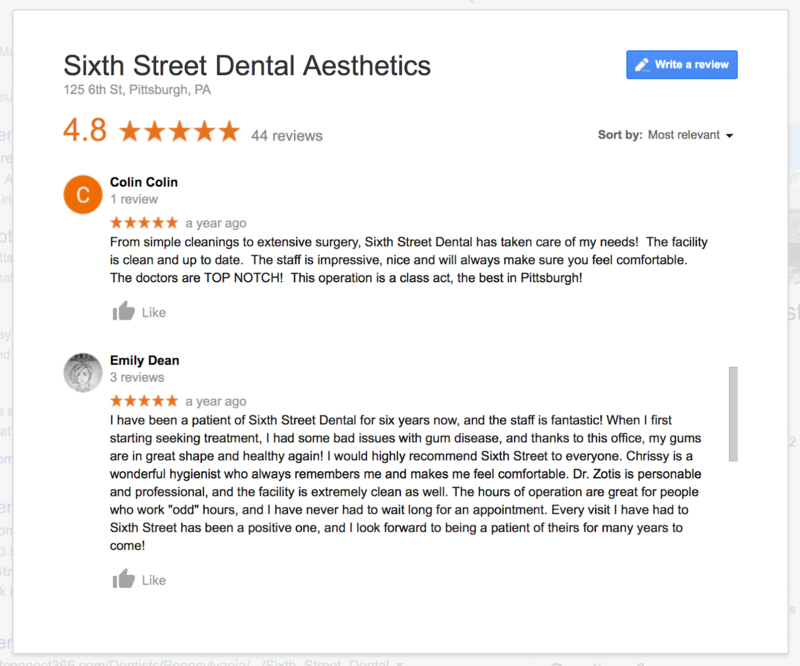 With nearly 50 reviews on Google, take the time to read about what makes us the best dentist in Downtown Pittsburgh. Ready to start your treatment with the best dentist in Downtown Pittsburgh? Get in touch with Sixth Street Dental Aesthetics today and learn how we can help you create the smile of your dreams! What Is Botox® & Who Is It For? Botox® is an injection that can be safely administered into the face and neck to help with sagging skin and signs of aging. Sixth Street Dental offers a diverse selection of dental services to the greater Pittsburgh, PA region. Services include dental check-ups, cleanings, root canal therapy, teeth whitening services and more.